How Far is ASF Isle De Royale? In the lush and rolling Aravalis, where Delhi hugs Gurugram, rises a gated, integrated and self-contained residential community Isle-de-Royal, with a world provided for, right in there. Isle – de – Royale residences is a high-end boutique development offering 2BHK & 3BHK apartments, which are intelligently designed as functional yet spacious units, capable of supporting modularity in use. This is a pre-certified Gold rated green development, extensively drawing benefit of efficient, reliable and sustainable services, infrastructure & utilities created at the neighbouring processing zone of ASF Insignia SEZ. Thus the residents at Isle-de-Royale shall have access to 66 kva grid power, 24x7 back up power, water & waste management systems, shuttle service to nearest metro station, etc. 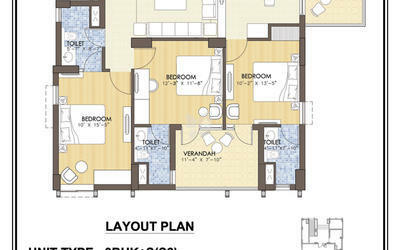 Isle-de-Royale residences comprises of three residential towers of which Tower A & B are on offer presently. The development is set in midst of a refreshing and aesthetically appealing lush landscape, promoting the concept of walk-to-work, and it boasts of an exclusive club house and host of recreational facilities, nicely nestled within the serene tree-lined parks and boulevards of Isle-de-Royale, where residents can relax in the lap of nature. Entrance Door : 7 Feet high moulded skinned polish finish door with brass/SS hardware. Windows/Glazing: Powder coated Aluminium window frames and glass shutters. External Doors towards the balcony: Aluminium Powder coated Doors. Ceramic Tiles upto 2' ht above the platform & Oil Bound distemper in the remaining area. Powder coated Aluminium window frames and glass shutters. Granite Counter Top, Stainless steel sink with drain board, Modular Kitchen. 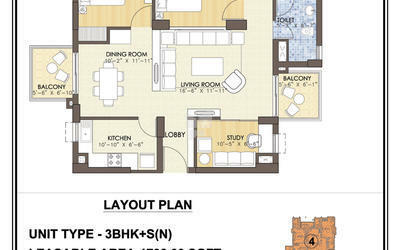 Provision for Geyser Point, Plumbing and electrical point for water purifier, geyser and chimney inside Kitchen. CP fittings of standard quality. External Doors: Aluminium Powder coated. Aluminium & Glass, MS railing provided. Ceramic tiles upto 7' ht rest oil bound distemper. Internal: 7 Feet high flush doors with polish finish and SS hardware. Hot and cold wall mixer. Electric point for geyser. Powder coated Aluminium / UPVC window frames and glass shutters. Marble counter top, Premium vitreous fixtures along with premium CP Ffittings of standard make Hot and cold wall mixer. Electric point for geyser. Internal: 7 Aluminium powder coated Door. Walls: Combination of Granite & Acrylic emulsion / Textured paint. Powder coated Alluminium frames and glass shutters. RCC framed structure designed as per relevant Codes and Seismic Zone IV. Adequate points with modular switches and concealed conduits for power, lighting & fans, ELCB & Circuit breakers of suitable capacity.Fire Retardant Low Smoke and Low Halogen (FRLSH) Wires are used for wiring. Telephone points in living and all bed rooms. Internet wiring in Study room. High performance lifts of reputed make. Richly landscaped outdoors / vistas / gardens. Gated residential community, treated water supply, waste management disposal, power backup services. Provision for Optical fibre network; Video surveillance system, Perimeter Security and Entrance lobby Security with CCTV cameras; Fire prevention, suppression, Detection & alarm system as per relevant fire norms.